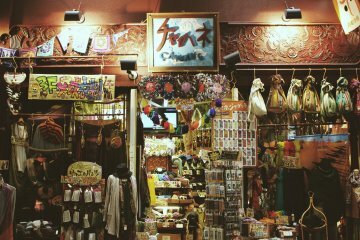 Have you ever wanted to dress in a traditional Japanese Kimono or Yukata but found these garments really unsuitable as modern-day wear? The allure of traditional Japanese dressing still prevails, but despite its charms, many don’t wear it on a day-to-day basis because it can be inconvenient and outdated with today’s trends. 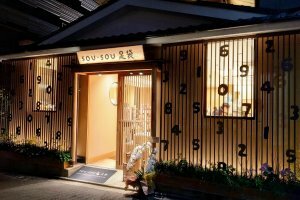 Sou Sou then, is the right mix between tradition and modernity to fulfill your desire of dressing the Japanese style yet keep up with times. Sou Sou is a designer fashion and homeware label that fuses tradition and innovation in its quirky, bold and colorful designs. 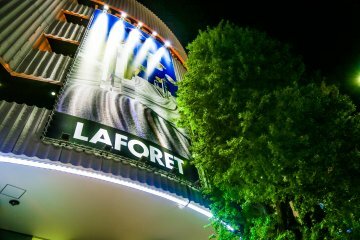 It was founded in 2002 with its first opening in Kyoto. 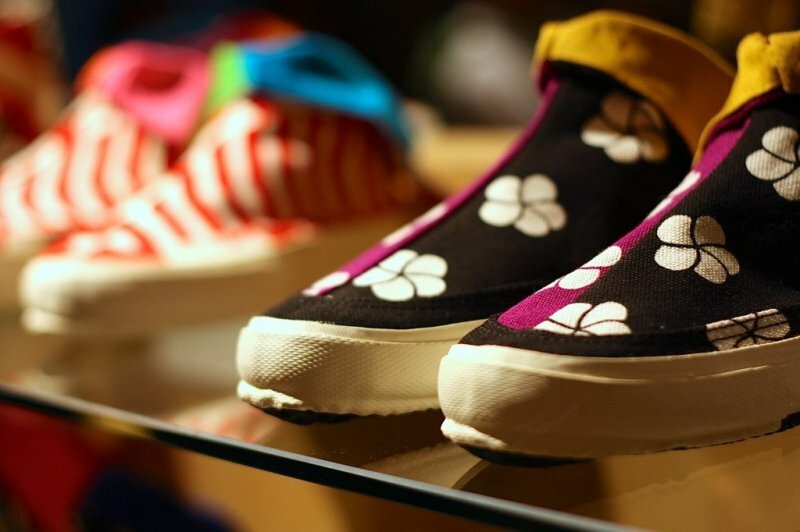 Amongst its diverse repertoire are kimonos, yukatas, bags, shoes, sportswear and textiles. 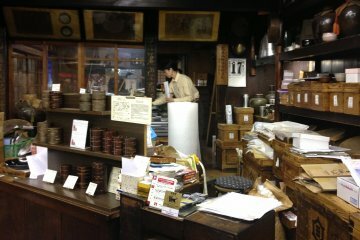 In Kyoto, Nakano-cho, Sou Sou has 8 stores, each focusing on different products. 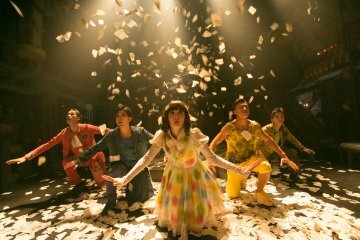 No stranger to collaborations, Sou Sou has worked with famed brands like Hello Kitty, Kikkabo and Uniqlo before and has Le Coq Sportif as its long-time partner. Founded by Katsuji Wakisaka, Sou Sou’s vibrant and playful designs are perhaps a manifestation of the international influences Katsuji gained from his international career. In 1968, Katsuji Wakisaka became the first Japanese designer to work for renowned Finnish textile company, Marimekko. The stunning nature of Finland is said to have crafted his taste for organic shapes and bold colors. Katsuji has worked in New York too. 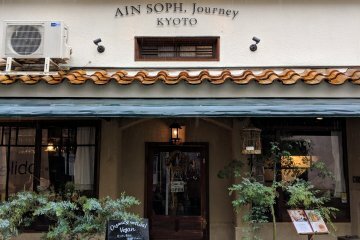 After returning to Japan, he started taking inspiration from his strolls around his hometown in Kyoto. Sou Sou designs heavily feature nature and put a modernized spin on traditional Japanese motifs. At Sou Sou, tabi socks, slippers and shoes come in unique patterns and prints. An icon of Japan, tabi shoes have grown from being functional shoes to an expression of personal style with many designs available today. The split-toe shoes that allow for good balance and grip were originally worn by gardeners, farmers and construction workers. Today, they have evolved to become a statement piece for the fashion-forward. The Sou Sou x Kikkabo pieces are truly avant-garde and would make a unique statement piece in your outfit. 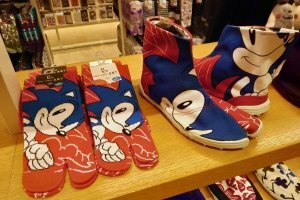 Or if you are into pop culture, there are always some contemporary designs to choose from, such as recent collaborations with Hello Kitty and other seasonal items like Sonic the Hedgehog. As for its clothes, unlike the ornate kimonos which are only worn on special occasions, Sou Sou’s kimonos are meant as everyday wear as its designs are an updated take on tradition with its modern cuts and prints. Apart from kimonos and yukatas, Sou Sou also has a wide selection of traditional-modern tops and bottoms. 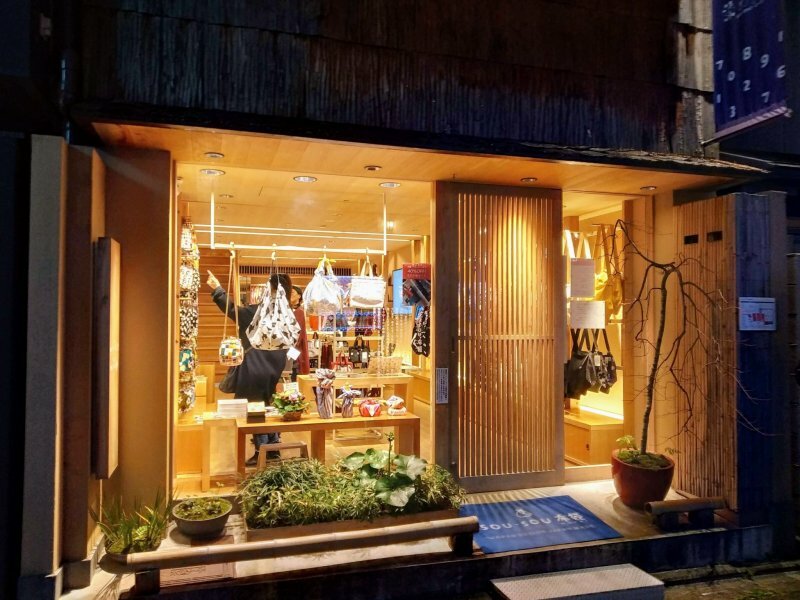 If you are into cycling (but fashionably), you’re in luck as Sou Sou has a wide selection of clothing created with Le Coq Sportif; ranging from cycling jackets to pants, hats, gloves, bags and more. If you rather invest in dressing your home than yourself, the Sou Sou has you covered with its textiles, furniture and dishware. 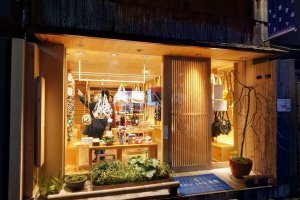 However, if you would rather just window shop, there’s no better place to come than Sou Sou to take in the sights the stores have to offer. 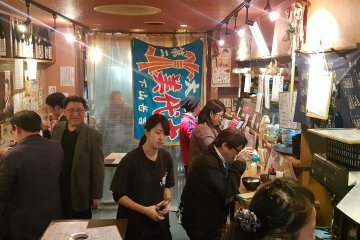 The staff are friendly and helpful to both locals and foreigners. 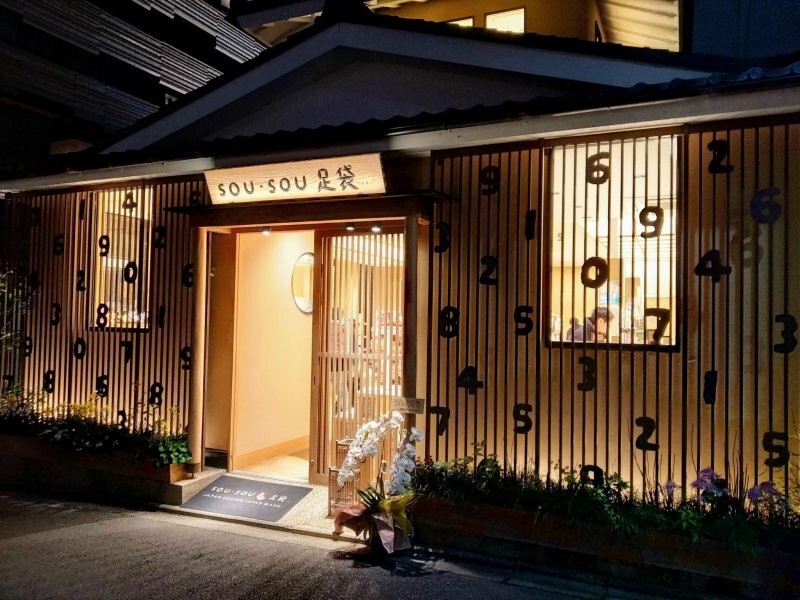 When you tire of browsing through the products, Sou Sou Zaifu (tea house) has refreshments such as matcha or coffee, with the staff even able to perform a tea ceremony for you! If there’s something that catches your eye, do note that the Sou Sou shops are tax-free. 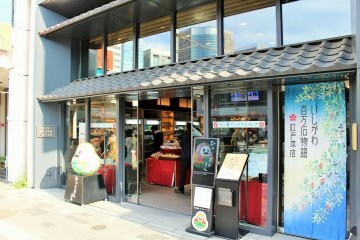 If you’d like to visit other Sou Sou outlets, there is one in Minami Aoyama, Tokyo, and even another in San Francisco. Alternatively, you can shop online at sousou.co.jp. Leave the station from exit 9. Then, turn onto Shinkyogoku-dori which is a sheltered shopping street. Continue straight ahead until you reach the second junction where you’ll spot the female apparel store, Clef De Sol. Then turn right out from the sheltered shopping street. Continue straight ahead and you’ll spot the cluster of Sou Sou stores. I remember seeing Taro Yamamoto, a nipponga artist wearing tabi shoes with me as we strolled in Kyoto. 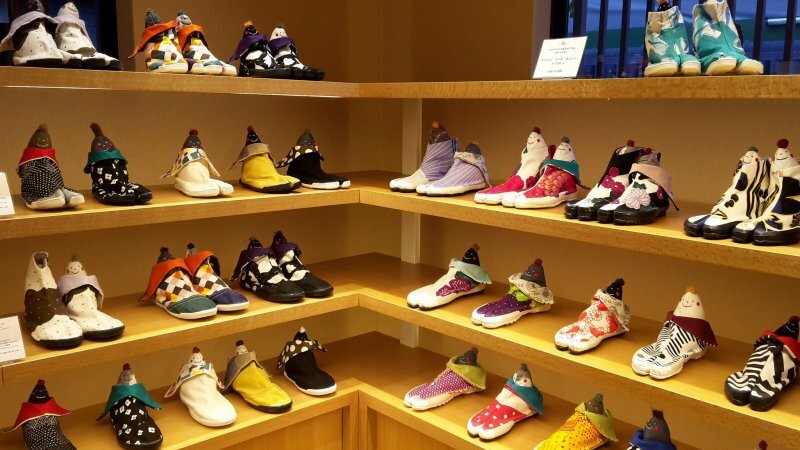 These great inventions are great for your feet too! My favorite summer outfit is tshirt, jeans and geta. 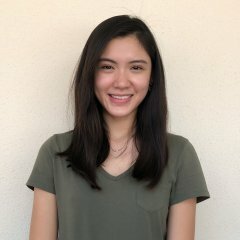 Summer chill! In the winter, my friends wear tabi socks and geta. Suave! 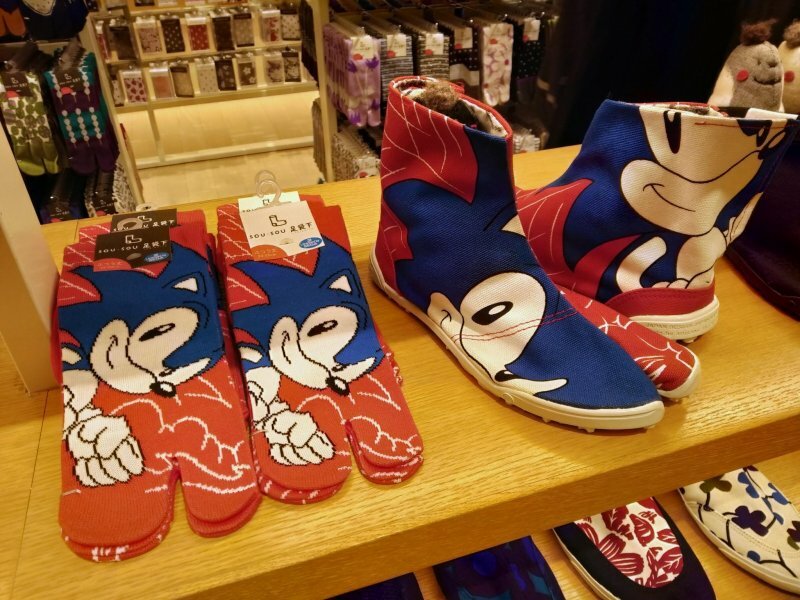 Those Sonic the Hedgehog tabi are great!